The second week of Jazz Appreciation Month right here in the Rockies gets going on Thursday with pianist Omar Sosa returning to Mount Vernon Country Club. 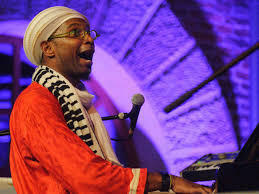 This time around, the Cuban-born pianist who came to America in 1995, has his Quarteto Afrocubano with him – a band that has Leandro Saint-Hill on saxophone, Ernesto Simpson on drums and the Mozambican Childo Tomas on bass. Sosa wraps up the jazz season at the country club in Golden with music that starts at 8 p.m. Prior to that, the buffet dinner begins at 6 p.m. and you can have the music with food or just the sounds alone. This is one quartet that should kick up a rhythmic storm just west of Denver off of I-70 (303-526-0616). Then on Friday, the highly creative Wayne Horvitz Septet keeps things going with a different kind of soundtrack. Horvitz is a talented pianist and composer who comes to Dazzle, 930 Lincoln, armed with cellist Peggy Lee and bassoonist Sara Schoenbeck along with drummer Eric Eagle, bassist Keith Lowe, guitarist Tim Young and Denver’s own Ron Miles on cornet. At Dazzle, Horvitz, who is the co-founder of the New York Composers Orchestra, will tell us how Some Places Are Forever Afternoon through an 11-piece suite based on the poems of Richard Hugo. The septet is on stage at 7 and 9 p.m. (303-839-5100). And earlier on Friday, at 1 p.m., Horvitz and his septet are performing at the King Center on the Auraria campus as part of MSU Denver Jazz Celebration. Over the years, Horvitz has been connected with creative masters such as Butch Morris, John Zorn and Carla Bley. And this event is sponsored by Creative Music Works. Also on Friday, there’s still another kind of sound on tap when the organ-swing trio co-led by Hammond B-3 player Tony Monaco, out of Ohio, and guitarist Fareed Haque, originally from Chicago, that has Greg Fundis on drums makes a stop at the Boulder Mennonite Church, 3910 Table Mesa Dr. in Boulder, at 7 p.m. (303-443-3889). Right after that on Saturday, the Monaco-Haque-Fundis trio moves into Dazzle for sets at 7 and 9 p.m. Later this month (on the 26th and 27th), Haque, whose heritage has roots in Pakistan as well as Chile, will be back in Denver with his Funk Bothers band that also has Fundis on drums. For that stop, Haque will be at Nocturne, 1330 27th St., starting at 7 p.m. (303-295-3333). Also at Nocturne this week, the Gift of Jazz Fest fills the club with sounds on Sunday from 2 p.m. until 9:45 p.m. with a host of fine, area-based band including pianist Annie Booth and her trio, the sextet co-led by trumpeter Bob Montgomery, trombonist Al Hermann and saxophonist Josh Quinlan, the Greg Harris Vibe Five and pianist Eric Gunnison’s trio that is the last band of the seven bands on stage before the closing jam sessions. Moving on to Tuesday, Nocturne has pianist Larry Fuller and his trio at 7 p.m. Originally from Ohio, Fuller joined drummer Jeff Hamilton’s trio in 1995 and five years later he became the pianist in bassist Ray Brown’s last trio. And more recently he worked with guitarist/singer John Pizzarelli’s group. At Nocturne, he has Katie Thiroux (who was mentored by John Clayton) on bass and Matt Witek (who studies with Hamilton) on drums. The music starts at 7 p.m.
Additionally this week, guitarist Earl Klugh holds his annual Weekend of Jazz at the Broadmoor in Colorado Springs with Sergio Mendes, Tower of Power, singer Morgan James, pianists Keiko Matsui and David Benoit, drummer Jamison Ross (who won the 2012 Thelonious Monk competition) and, of course, Klugh. This year marks the 40th anniversary of the release of Klugh’s self-titled, inaugural album and his highly successful event at the Broadmoor runs from Thursday through Saturday (866-837-9520). Some others sounds around come from saxophonist Peter Lewis and drummer Claire Church’s Expedition band at Dazzle on Thursday at 7 p.m., saxophonist Lynn Baker’s quartet at Nocturne on Thursday at 7 p.m., guitarist Mike Robinson, who know lives in Brooklyn, and his trio at Dazzle on Sunday at 7 p.m., groups from Green Mountain High School at Dazzle on Tuesday at 7 p.m. and the Wyoming Jazz Ensemble at Dazzle on Wednesday at 7 p.m. In Louisville, at Silk’s Music and Social Club, 908 Main St., pianist Peter John Stoltzman’s trio plus singer MaryLynn Gillaspie perform on Saturday. The doors open at 7 p.m. (RSVP at 303-477-3730).